HATTATT: Who Will Save Me? Tura, with its turrets, towers and trap-doors is seductive. And we have long wished to be seduced by this Loire Renaissance fantasy of 1883, the work of Ybl Miklós, architect of the most splendid Budapest Opera House, which stands, battered and scarred, abandoned some ten years since by the occupying Soviet troops. 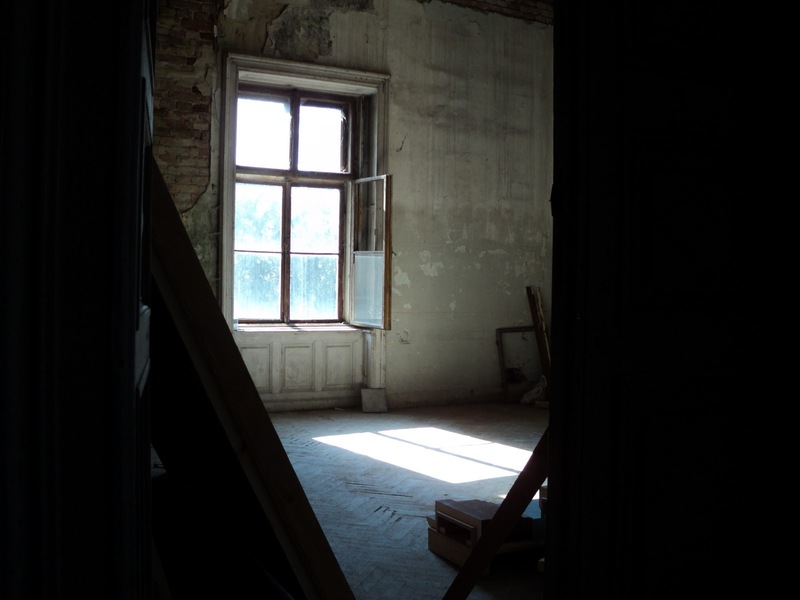 Just days ago, standing in the erstwhile Palm House through which shafts of October sun penetrated the broken casements, we reflected on the fate of this, and other, endangered Hungarian mansions. Here, at Tura, the signs of serious neglect are all too apparent. Plaster and stucco crumble, cold damp seeps through roofs and walls, iron corrodes, glass shatters. 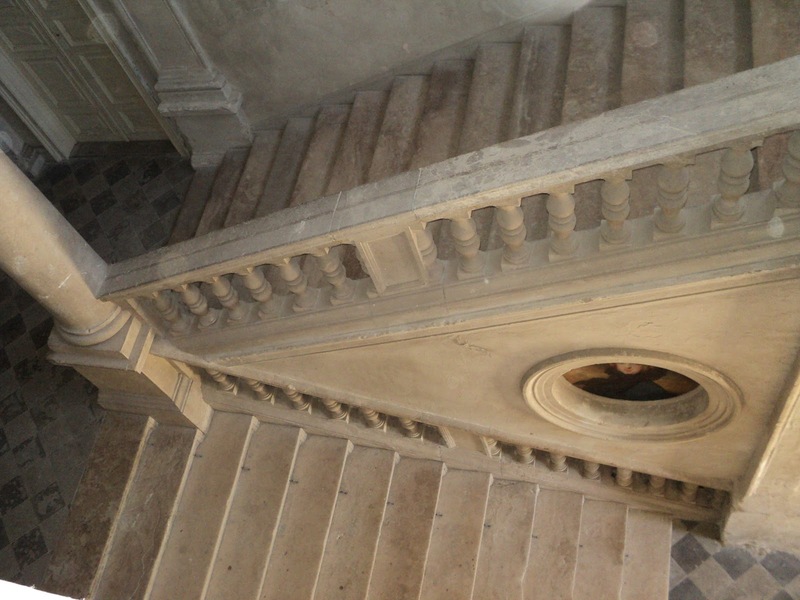 Climbing the principal staircase, relatively undamaged, the first floor presents a sad picture: a bedroom corridor echoing to our footfall; pit props in support of a collapsing ceiling; a bird nesting atop the pediment of a door; a balustrade threatening to fall. 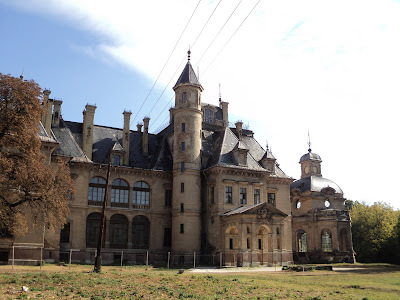 Later on, now in the village of Aszód, we merrily trespass into the Baroque splendour of the palace there where institutional use has paid a heavy price. As at Tura, change and decay, but here we take flight in the face of a threatening caretaker with, we are convinced, his rabid dog in tow straining on a seemingly fragile leash. Homeward, but not before we have tried, and failed, to gain entry into the Sleeping Beauty of a castle at Acsa where bell towers silently call across the wooded valley. How romantic it all is. And we, who pride ourselves on being level headed, have fallen in love. In love with the prettiest little manor house in the far west of the country. could this become the Hattatt Kastély............? Affordable, just! Requiring complete renovation, a certainty! On Saturday we have an order to view. How exciting is that?!! 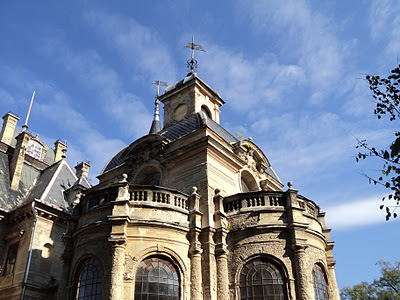 There needs to be a Euro fund to preserve and restore such important buildings in the less rich Euro member countries. Don't include Italy, as they have proven they waste such money. Paying guests in the Hattatt Kastely? I looks wonderful. A project to get your teeth into. It looks amazing, good luck! PS It is very sad to see such beautiful buildings in disrepair. Fingers crossed that one day they will be given the care and attention they deserve. Very exciting!! And a wonderful project. Please carry on trespassing for our benefit. We could not agree more. We read somewhere that greater Hungary had more castles and palaces built than any other European country and, of course, many of them are now in desperate need of saving. Andrew, should you ever visit Hungary, you would be a welcome guest for free!! There is so much to consider before we can embark upon this......certainly not a project for the faint hearted!!! Exciting, and I imagine quite scary ... but oh, wouldn't it be lovely! Exciting and scary both! !We shall certainly report on our progress. Rather too many rolls of wallpaper we fear here would be needed and so, most probably, it would be our trusty Farrow and Ball on walls and ceilings that would be the order of the day. Very exciting! Hattatt Kastely sounds most fitting. The little Manor House is stunning, be sure to take your camera with you on the viewing, is it currently occupied? We are somewhat ashamed to say that we have trespassed into and around so many buildings in our time that we have lost count. A hobby or an affliction, we are unsure about how best to describe it!!! Yes, a mixture of excitement and terror, but perhaps that is the stuff of which dreams are made?!! We are delighted to see that you have signed up as a Follower and thank you so much for your kind comment on our previous post to which we have made general reply. Most certainly the camera will be fully employed on our visit. At present the house is empty and has been so for many months. The picture is from two summers ago and so we are keeping an open mind as to what we shall find!! OMG - I love it and have booked my ticket to visit you! Only joking :-) That surely is as close to heaven on earth as you can get and well worth the effort and money you put into it. Have you ever seen the movie "The Money Pit". It's good to retain a sense of humour. I wish you well and if any of those other mansions were in London they would be tiny apartments by now! Jane and Lance, Good-Morning my friends. As the song words, from Nicki Minaj latest record says "can you hear my heart go bum, bum bum" at the site of this house. Hattatt Kastely it is, the name is already established. What a dream. I shall be waiting to hear your next post. So lovely to have you back. What a shame to see the 'patrimoine' falling into disrepair. Empty and unloved building are so sad. Often the biggest challenge is what do you do with these buildings once restored? What exciting news about the manor house! Look forward to hearing the outcome of the viewing! That will be some project can't wait to learn all about it, it is sad these wonderful buildings crumbling to dust, too bad they couldn't be renovated to apartments or something. A lot of work, but it may be worth it! We are thrilled that you like it too, although what it will look like on a chill October day we know not! We have already experienced the many trials and tribulations of restoration work in Hungary with our current apartment. But, the Manor House will definitely be an experience at a different level! !We shall see. Thank you so much for the kind comment which you left on our previous post and to which we have made general reply. Good morning, dearest Helen! This is the closest we have seen to an Irish Georgian manor house and, as you say, it could have our name over the door. However, it has not been lived in for some time and we think that the reality may be some way from the picture which is several seasons old. Try as we might, we really can only think that we can create two bedrooms from it with all the other things which we wish to accommodate!! However, a guest room would always be available for you!! Thank you so much for your kind comments which you left in our absence on our previous post and to which we have made a general reply. As you say, it is all very sad to see such wonderful buildings falling into decay. In Britain we are so used to buildings of note being afforded some protection of some kind and grants for restoration but in Hungary there seems to be little in the way of practical help or support. Now with decades of inactivity, many buildings are simply beyond hope. It really is just a question of money being available for such investments. Sadly, there does not seem to be very much of it about. Thank you so much for your kind comment on our previous post to which we have made general reply. Jane and Lance - you're kidding!! - what a lovely house it looks...just when I thought you'd never want to change what you have! Bravo, if you do, and bravo for even thinking you might! We agree. It is in serious need of love and affection. Sadly, money too. We are bracing ourselves for the reality of the situation when we see it 'in the flesh'!! Oh yes, most certainly a lot of work. But, would it all be worthwhile.....that is the question? Perhaps the Kastély will be a pipe dream....we shall see. Whatever, we should never wish to leave Hungary since we really do now think of 'The Motherland' as home!! Thank you, dear Faisal, for your kind comment on our previous post to which we have made a general reply. This is such exciting news, can't wait for the report after your saturday viewing...if you buy the place, I hope you leave up all that lovely ivy!!! Oh that is so utterly beautiful, I had always wanted to live in a ivy covered house. It's very good to see you both back, you were very much missed! Yes, we love the creeper too. We promise to only remove that part growing on the INSIDE of the house and, of course, the tendrils invading the roof!!! I am happy to see you back this morning with a wonderful post, I hope you are both well. Such beauty! I can only think that any restoration would be a worthy endeavour. Saturday wil be an exciting day for you and I wish you the best of luck. it is a shame that grand old dames get left to wilt and fade into shadows of their former vain gloriousness. Perhaps one of them at least can ruffle their tired old petticoats in anticipation of long needed and much welcome resurrection to their former glory. I'd love to get my hands on "Tura"
We are so thrilled that you like the house too. There are surely more such houses to be found throughout Hungary if you should wish to be winkled out from the UK!!! Thank you so much for all your kind wishes during our absence. We have made a general reply to your comment on our previous post. Thank you so much for your kind comment. Exciting, certainly and expensive definitely but we do rather like being adventurous. Whether this is a step too far we shall see. All judgement reserved until we have seen it at first hand!! Thank you for your wonderful comment.We are sure that you would love Tura. It has such a special atmosphere and, even after all these years, we were still transported to another world when we entered the door. You are so right. A campaign to save these 'Grandes Dames' of Europe is urgently needed!! It well befits your dignity and grace and should indeed become the Hattatt Kastély, but only if this plan is not at the expense of your notion of owning a half-ruined Georgian mansion in the west of Ireland. The people of Ireland, who are all busily learning Hungarian and the Latin names of flowers, would be very upset if that dream were to fade. I have missed you soooo much. What a joy it is to have you back and with such an amazing post! Congratulations on having the bravery to consider restoring this beautiful building. The house looks like a place that has known warmth and love and and it seems to beckon not to be forgotten. I'm looking forward to further updates as you explore the possibilities for being 'the chosen ones'! Dearest Mise, to own one Georgian mansion may be considered foolhardy, to own too must be pure madness. Still, that could be a description which we could live up to!!! Whatever, a trip to the Emerald Isle will surely be on the cards one day and then there shall be testing of Latin names!! Yes, do houses choose their owners we wonder? In our experience we can certainly identify with this. Thank you so very much for all your kind thoughts and wishes. We have missed everyone too and it is good to be back at the keyboard once more!! We are so pleased to read that you love the house too. You are so right about priorities. There do seem to be so many worthy causes in need of financial assistance these days and yet governments the world over seem to waste money on projects which, in our view, contribute little to the health or cultural wealth of Nations. What a wonderful project, to restore that beautiful, vine-covered manor house. I love your photos of the decaying buildings, but am sad to see such beauties in this state. They have such wonderful detail. It seems almost unconscionable to let them fall into ruin this way. I hope you get the manor house and we get to be privy to its restoration. Lance and Jane! What a beautiful manor! I keep my fingers crossed that it becomes Hattatt Kastély! I am already looking forward to some pictures of the interior! So exciting! I wish I could come and view it as well! GOOD LUCK! I have my fingers crossed! Oh my such happy news.I hope you have lots of luck with it.How great to know someone who lives in a castle.lol.Im such a fairytale Romantic. Blessings to you both,keeping my fingers crossed for you. Oh my heavens it's the stuff of dreams! Welcome back Jane and Lance, and how exciting for you both to be viewing such a beautiful house! How sad to see the other buildings falling into decay when they are of such architectural merit. But how wonderful to have the opportunity to save and bring back to life and restore former beauty to one building at any rate. I do hope all goes well for you both - I am excited for you and will keep fingers crossed!!! How tempting! Keep us posted. We do so agree that it is almost unthinkable that such beautiful buildings could have suffered so much. And now, of course, the cost of restoration is ruinously expensive. The picture of the manor house is some two years' old and so we are concerned about what the current state of the building might be. We shall, of course, be capturing it all with the camera! We shall be accompanied by friends at the viewing so hopefully that will enable an objective view of the whole situation to be made. Otherwise we fear that romanticism may get the better of us! Thank you so much for your kind comment on our previous post to which we have made a general reply. We really feel that we shall have to guard against romantic notions otherwise ruin could be a mere step away! However, the photograph alone is seducing....!! Thank you so much for your kind wishes on our previous post to which we have made a general reply. So good to have you back. This seems to be a very interesting project you are planning to undertake. Good luck. May be your project will encourage more people to come forward and help save these historic buildings. Dear Gill, thank you for your warm welcome back and your kind wishes on our previous post to which we have made a general reply. It is indeed sad that such important historical buildings are in such a parlous state, but the finance required to renovate them all is quite beyond a single country. A concerted effort across Europe with a dedicated restoration fund is urgently needed in our view. Perhaps one day? The idea of breathing new life into the Kastély is enticing but at what cost we wonder?!! Tempting indeed, but will it prove to be the ruin of us?!! Thank you for your warm welcome. We are so pleased to return to the keyboard! Well, every little counts we suppose but the scale of the numbers of buildings requiring substantial investment is overwhelming. It is truly incredible. Hallo Jane and Lance, glad to have you back. In many European countries the maintenance of crumbling houses is not a priority. Buildings of national importance might get sympathetic treatment, but others just have to take their chances. 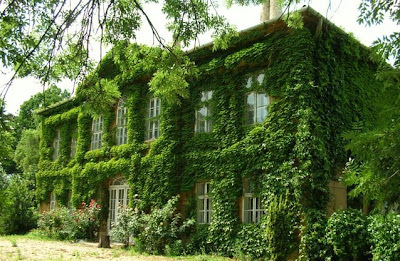 How wonderful if you could rescue your very own manor house, perhaps the ivy will hold it upright during your lifetimes. I am looking forward to learn about future developments. So that's where you've been, gallivanting about the countryside and exploring crumbling mansions. Jane and Lance....go for it! How wonderful to have the opportunity to possibly buy such a beauty. Not for the faint hearted is true, but you have had building challenges before in Herefordshire and I'm sure you would succeed. We are two years into the renovation of a 16th century grade II building in Northumberland...spending more money than we intended but still utterly worth it as it slowly comes back to life. Thank you so much for your warm welcome and your kind comment on our previous post to which we have made a general reply. Sadly, not all our time has been able to be spent cavorting about the Hungarian countryside, much as we should have liked to have done just that! As you say, there are plenty of other priorities for spending money in former Eastern Bloc countries and, although many notable renovations have been effected, there are still too many other sad cases to be addressed. Still, perhaps we may have a chance of restoring at least one more to its former glory, who knows?!! Julie,we were touched by your words about our former challenges in Herefordshire. And, it is true that we overcame many difficulties there at considerable personal and financial expense. However, some seven years on, we are perhaps if not wiser more cautious about taking on new and unpredictable adventures. We are in awe of your efforts in Northumberland and are sure that the finished result (are any of these projects ever finished? )will be remarkable as well as intensely satisfying to you personally. Thank you for the warm welcome back, Diane. Huge, yes, we are sure that it will be. How huge, we shall see on Saturday!! All these buildings are so photogenic and it would be wonderful to see them being used and occupied again. But these days, seeing how we've got used to our comforts, the heating costs alone would be stratospheric and a serious a disincentive. Pity, all the same. Sleeping Beauty castles. How perfectly gorgeous they are. And how heartbreaking to allow them to fall into disrepair! Yes, yes, you should follow your whimsy and buy that place!!! Edward and I shall come for tea on the first day of Spring! Can't quite articulate the very positive feeling which swept over me at seeing your post in the queue. Love is strange, and so is absence. Are you really looking into purchasing this grand place?? Thank you for your kind words on our previous post to which we have made a general reply. It is a curious thing that in Hungary no matter how cavernous the building it is always hot in winter. Museums, churches, you name it, they are always wonderfully warm even when the weather is Siberian. In the Kastély we should have to be able to heat it as we do get miserable in the cold. All will be well provided that Mr Putin keeps the gas flowing!! Thank you, Jane, for your warm welcome and kind wishes on our previous post. Yes, we too share the excitement at being able, perhaps, to breathe new life into the Kastély and once again to have its walls resounding to peels of laughter. But will they be shrieks of despair when we actually see it....time will tell!! Hope it turns out to be just the ticket. Wow - what an undertaking though. We are certain that you should love these most romantic of abandoned palaces and castles, Pamela. It really is the stuff of fairy tales made even more tantalising when entry is either forbidden or dangerous!! You are always welcome to drop in for tea, whatever the season but Edward would certainly prefer the acre of garden at the Kastély rather than the small outside space which our present apartment affords. A very attractive house. It looks like a perfect project for you, large enough to be grand, but small enough to still be domestic. You two seem to have the energy, taste and background to tackle it correctly. Dearest fairy goddaughter, how we have been cheered by your many kind wishes during our absence. We have missed our 'conversations' and are so happy to be 'speaking' with you once again. We can imagine that you would make a wonderful companion in the merry trespassing. Indeed, we are quite certain that you would 'boldly go' across any frontier and we should so enjoy travelling along in your wake! Yes, it is true that we shall see the Kastély this coming Saturday at 11.00am! It may appear 'grand' but has been empty for months and will, we are sure, have a rather sadder face than the one presented in the picture, designed to entice buyers. Still, we are philosophical and shall see what transpires. 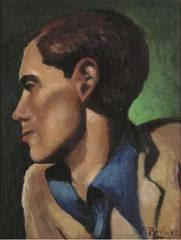 Although not usually fatalists, in matters of property we do think that what is ordained will be. You may pick up the vibrations in Texas!! Well, it is really not too far from Spain to Hungary and in most matters practical we are pretty useless. So, dear Mitch, if you are free on Saturday....!!! We are so pleased that you like the manor house too. We shall see whether we are laughing or crying after the visit!! Yes, most certainly a project to end all other projects that we have ever tackled that is for sure. A mixture of excitement and fear....!! We agree with you completely about the scale of the house. Large enough and architecturally detailed enough to be of interest and yet intimate enough for the renovations to be affordable and the whole house capable of being used when completed. We have some knowledge of dealing with Virginia Creeper and know how destructive it can be when growing in the wrong place. And so, even if the prospect is somewhat distressing, much of it may have to be removed in order to tackle the problems which lie underneath! Welcome back, you were so very missed by many people. If you can manage all that goes into having such a grand house, you must buy it. With your help, this beautiful home will not become another casualty to neglect. Again, it is so nice to see HATTATT again on my reading list. I can't wait to hear of what happens on Saturday. Good Luck! What a wonderful grand project it would be to have this little manor house to restore. Would this become your primary residence? How exciting! I can't wait to see the interior. Jane and Lance, you are back!!! Wonderful news, my afternoons are now back in order, drinking coffee afterwork and reading your blog. And what a piece of heaven you found! Exciting adventure ahead of you! Oh, I would So have loved to taken a peek inside. Maybe in future you can buy a suitcase full of complex looking techno junk, proclaim yourself "ghost hunters" and gain access to some wonderful haunts! Honesty is all well and good but sneaky gets the job done! Thank you so much for your warm welcome and your kind wishes on our previous post to which we have made a general reply. We shall have to see whether we have the resources and the energy that such a demanding restoration project would demand. But, we have to admit that we are excited by the prospect. Thank you once again for your generous comment. We are touched by your words. Dearest ASD, you are so very generous and kind. We have missed not being in touch too. We actually have a croquet set from our Herefordshire days and so we think that your idea is absolutely perfect. Just one problem....first create a lawn!!! Yes, Howard's End, almost a first thought of ours and we can only wonder whether the interior will live up to the promise of the photograph. Saturday will reveal all. We loved your description of Tura as 'trembling'. A perfect word. Fragile and yet still standing...just. We are sure that you would love to see it!! Yes, if bought, then the Kastély would become our main house. It really would need to be lived in if it was to be fully restored to its former glory. We shall, of course keep you posted about the outcome. Thank you so much for your kind words on our previous post and for the warm welcome back. It means a lot. We are thrilled that you approve. Cool most definitely as the heating system needs replacing!!! Dear Red, thank you so much for your kind comment on our previous post and for your generous welcome. We have missed you too. Yes, we think that we can safely say that the restoration of the Kastély would be an adventure. And, like all adventures, it both entices and terrifies!! As always, dear Helen, you are wonderfully inventive when it comes to doing things which are illegal, dangerous or just scary. Now, why did we not think of the 'Ghost Hunter' line? On second thoughts, we really do not have the Hungarian to explain such things. Could you help out? Thank you so much for all your kind wishes on our previous post to which we have made a general reply. Welcome back Jane and Lance! Oh, I think we've ALL fallen in love with the Hattatt Kastely. How exciting and yes...a little scarey too. But oh, how could you resist, right? It is just beautiful. Good luck to you Saturday and we are so looking forward to hearing more of this fairy tale dream. Thank you for sharing these breathtaking places with us. We do have to admit to a fair bit of trespassing in our time, although it is always more favourable to be invited in through the hall door if possible!! We are trying NOT to fall in love with the Kastély although our conversations have been of almost nothing else for days. Losing one's heart to a house is all well and good but we are trying to be practical too. Difficult!! Goodness, the prospective new Hattatt abode looks enchanting, and I like the symmetrical frontage - so very Georgian, but "neoclassical" there, I presume. We are, we fear, rather in the way of bad pennies which can always be relied upon to turn up! We are, Barbara, so very appreciative of the comment which you left on our previous post and to which we have made a general reply which does, we trust, explain the recent absence. As for the Kastély, much will depend on Saturday and, most likely, thereafter the report of a surveyor and an estimate of building costs. We are trying hard to keep our feet firmly on the ground!! We are, as you may imagine, so hoping that on Saturday all will live up to our wildest hopes and expectations. The few pictures of the interior which we have so far seen suggest that a great deal of work is required and we are informed by the agent that there are some structural problems. At the end of the day it all becomes a matter of cost! We shall see [and doubtless report!]. Welcome back!! So good to know that you are well and blogging once again! Marvelous dwellings and to contemplate owning the charming vine swathed abode is indeed an exciting prospect! An enchanting 'little' manor house. It takes a lot of courage (and money) to take on a project like this but would bring you huge excitement and reward. I shall so look forward to your next post. Oh, my Ivied Walls!! You MUST! Inside unseen. It's enchanting and magical. And don't clip a limb. Lovely to have you back. Oh, my STARS---my secret word is NEDEDIT. An omen, certainly. Thank you so much for your warm welcome. We agree, an exciting project indeed....but think of all the curtain material needed?!!! We fear that we might have rather more courage than Forint and can easily see financial ruin for the love of a house. Hopefully our friends will dissuade us from such a reckless course of action! Oh dear, and now our friends and Followers are seeing it all written in the stars!!! How shall we be able to resist? We are so pleased that you like the house too. It really does have charm, we think. Thank you so much, too, for your kind words left on our previous post during our absence. They touched us! Dear Jane and Lance - have fun on Saturday. The house looks absolutely beautiful and what an amazing opportunity. It looks very special and I hope it's just as lovely inside...potential wise at least! This 'home' looks magical - good luck. Annie x. Now fun is exactly what we propose to have on Saturday. The exterior does indeed show promise but we do have concerns about the interior coming even close to matching it. We shall see!! Thank you very much for your kind comment on our previous post to which we have made a general reply. Of course! But, you are welcome castle or no castle, especially with the words of Hungarian. Now we are intrigued...!! it sounds very very exciting... wow! We are sure that you would love all these romantic ruins, and there are so many scattered across the Hungarian countryside. Riches indeed! Thank you for your kind words that you left during our absence. They mean so much. WOW! Wonderful house ....... could make a lovely home. Bonne chance! Sorry to hear about the illness of your friend. I hope he/she is feeling better. When reading your comment on my blog I realised I used the wrong name for the plant I meant. Thank you for letting me know!! Such a shame the Hungarian government doesn't have money to maintain these monuments. The palace of Tura looks like a beautiful place. Even in all it's bareness. The (maybe) future Hattatt residence looks very romantic indeed. All that ivy...It could be situated somewhere in England. I will cross my fingers you will be able to make it yours soon! We are so pleased that you like the house. What the interior will be like is anyone's guess....surprises all round we expect! Thank you for your kind words during our absence. We appreciate them very much. Thank you so much for your kind words. Sadly, our relative is terminally ill and so it was imperative that we took flight . Happily, he is comfortable and is receiving the best of all possible care. From your description we just knew that it would be Verbena bonariensis which you had discovered. It is a gem and will look lovely in your very pretty garden. It seeds about graciously so do not deadhead. Tura is indeed delightful, we are sure that we would love it. And, of course, your photographs would be so much better than our poor efforts. The Kastély as you say has a definite Englishness about it and yet is deep in the Hungarian countryside!! If wishes alone could restore the former beauty to these buildings, no money would be required. I think these would make the perfect setting for a film. It's like seeing an elderly lady who is frail and fading, but still elegant, graceful and with confident poise. One is certain that in her heyday, heads turned. Let's hope there's life in the old dog! Well, fun it could well be for the first few minutes and then an enormous amount of hard work and headache we imagine!Still no gain without pain or so they say!! Yes, you are right. So much goodwill but little in the way of hard finance. We love your description of these enchantingly romantic places which are, as you say, just like being on a film set. Will there be life in the 'old dog'? We should dearly love to think so, but will there be money for the facelift? We shall see!! Thank you for your kind wishes during our recent absence. We were touched by your words which mean so much. Thank you so much for your warm welcome and for your kind comment on our previous post. It is, we agree, so sad to see so many wonderful buildings falling into disrepair. And yes, to have the chance of saving one would be a thrill. The light streaming through the windows of the Palm House was utterly magical. You are so right. It could so easily have been a scene from a fairy tale. Saturday cannot come quickly enough, although we are trying not to raise our hopes too high. How exciting that you are looking at the fine manor house, which, under all those vines, appears to have very good bones. I hope you keep us posted on your tour! First of all Jane and Lance, welcome back and I hope that all is well and you have sorted out everything that you needed to sort out !! ....and, what stunning buildings. They certainly need to be preserved and, how wonderful for you to perhaps get the chance to do that very thing. When and if, you bring it back to it's former glory, I, for one, would love to see it. Yes, that is what we are rather hoping. The few pictures we have seen of the interior look interesting although we suspect that the condition overall is less than good. One of the deciding factors will be the state of the roof! We shall be much better informed after Saturday. Thank you so much for your concern and your kind words on our previous post to which we have made a general reply. An elderly relative who is very ill has kept us away but we are now reassured that he is receiving all best possible care. We are sure that you would love to see all these marvellous castles, palaces and mansions. There are so many and each has an individual charm which we find beguiling. With or without the Kastély we should love for you to visit. What fun we should have, to be sure! Oh god, how crazy, but beautiful is to fall in love! Try to keep your mind clear, to stay calm and cool, but how to do that being in love! Welcome back. And it's VERY exciting, what a wonderful looking place. In fact, they are all wonderful. The SPAB, of which we are members, quite often runs articles about historic buildings under threat in non British countries. It might be worth alerting them about the marvellous places in Hungary. It's strange, but I thought that the super buildings that survived Communist regimes were treasured now. Just imagine what they'd do with it in England! Welcome back Jane and Lance! I was about halfway through reading this, when my phone buzzed, bringing news of a message from your good selves. That made me smile a great deal. What a fantastic range of places you have visited, and how exciting to have the opportunity to live somewhere like 'Hattat Kastely'! It must have been an odd experience to see such a fine old building being left to slowly go back to nature. I'm really not certain whether I think they should all be preserved, or whether in some cases, old buildings are better being left alone. Such a difficult question and all I know is that in the vast majority (but not all) of cases, they simply don't make em' like they used to! We are desperately trying to stay cool, calm and collected but by Saturday we think that we may well be in a state of complete disarray. Stay tuned! Thank you so much for the idea about contacting SPAB they may well, as you suggest, be interested to know about the buildings at risk in Hungary. There have been many successful restoration projects but they are few and far between in comparison with those truly wonderful buildings which are still under threat. As for anything resembling WofI or Grand Designs, nothing like that here. Szép Lakás [Pretty House] is the most popular publication but a recently launched architectural magazine might be a possible source for an article to raise awareness. We shall try! We first knew of Tura from a magazine article in Country Life some eight or so years ago now and we have wanted to see inside ever since. Hence, actually achieving that goal was a source of pure delight. However, we can absolutely see what you mean about leaving well alone in certain cases as the restoration can be insensitive and can eradicate everything that was beguiling about the place in the first instance. We regret to say that this could be the fate of Tura. Oh my goodness, to have heard from you both after what seemed like an eternity and you are visiting one of the most romantic looking places I have ever seen, possibly to by, all of this at my bedtime--now I ask you--how on earth am I supposed to sleep tonight from the excitement? One little thought: if the castle is a go why not set up a little donation fund? Maybe all of us together can buy a bit of tiles or somehing...yes, yes, very American of me to say but a good idea nonetheless! Thank you so much, dear Heather, for your kind wishes in our absence and your warm welcome back. Your words touch us and are very much appreciated. Now, a donation fund for the Kastély. Brilliant! Although, we can foresee problems at the borders when, in our experience, unless everything is accompanied by a myriad of paper all signed several times in blue ink,nothing but nothing will get through. Still, a lovely idea!! And, dearest Heather, why should we allow you to sleep when we have been up until the early hours chattering away about gardens, the possible state of the roof, heating, lighting, sewage.....?!!! Oh my, how utterly divine - I hope its affordable, what a project. What a lovely life you live. Oh my an ivy covered house...how magnificent! And you have already named it...this is not a house that would be without a proper name. I do hope we get a tour of the interior. I wonder if it is currently occupied? So exciting!! Having first looked through all the comments, I was so sorry to read that your relative is very ill. I expect it will be of some comfort knowing that he is in good hands and receiving the best care. It is lovely to have you both back. I am so excited that you are to view the manor house! It looks like nature has taken it over, but what a wonderful old building. When I first set eyes on the interior of my Victorian house, it had water running down all the walls, exposing huge holes in the plaster and horse hair. It has been a labour of love restoring it, but I have never regreted buying the house. I am so looking forward to reading about your viewing! I'm thrilled you're back, Jane and Lance. But now I know I needn't have. You were searching for a dream and found it. Let us know what happens next. This is rather sad to hear, but nothing new to me. I grew up with the communist rule in East Germany. The abuse of historic sites was common. But to see it still in Hungary of today is disheartening. But it's all about money and there is not enough of it-like elsewhere in Europe. Even more so I salute you in your endeavor to try to save a sleeping beauty. I am sure you must be in a double helix of excitement and fear since so much not only depends on your ability to finance, but also on the handicraft of available laborers to complete such a task and labour of love! Oh this is so exciting ! I hope you end up buying it. Would be an amazing project! Well a very warm welcome back to you both! Your wit has been muchly missed. So you are back--and just in time to report on QUITE an exciting venture. Easy to see why you are tempted. Good luck! To think of purchasing and restoring this wonderful house sounds like a dream come true. How very, very exciting. And that would mean another garden and who better to do it! It is indeed heartbreaking to see the decay of such wonderful and irreplaceable works of art. A building needs loving care if it is to survive. That final picture of the manor house is SO intriguing. Buy it, please! We want to see what you do with it. Completely! What luck! I can't wait o hear what happens. What fantastic properties. To think too hard about it becomes somewhat daunting. Are we really wanting a project of this size at our time of life? We hope so although when we have seen all on Saturday then the picture will be clearer. Oh be still my heart!!! Can it be true...are you really looking to purchase this glorious manor??? I'm thrilled from head to toe at the prospect. These ancient, beautiful homes need to be adopted and cared for in their old age. How thankful this little manor will be, to be once again a beloved home. Wishing you all the best in your new adventure...it's so exciting! It is all very exciting and we shall just have to see how it all works out. The house, as far as we are aware, has been left empty for at least two years and is not, or so we understand, in very good repair. Updates will follow!! Thank you so much for the kind comment left on our previous post to which we have made a general reply. Where and when it is possible we, like you, favour the restoration of old buildings even if, as in many instances, new uses have to be found. Much, in this case, will depend on affordability which will only become clearer when we have some professional advice. Thank you so much for the comment left on our previous post to which we have made a general reply. We are delighted that you have found the houses of interest. They are, apparently, only the tip of a very large iceberg of castles, palaces, mansions and manors throughout the country which are in desperate need of restoration. All of which, as you will know only too well, were seized by the State in the past. Thank you so much, Abby, for your concerns about what is, in fact, our last surviving parent who is, very sadly, terminally ill.
From what you say, you will appreciate only too well the trials and tribulations, and expense, of restoring an old house. Your own sounds to have been a major project but we are certain that it has all been worthwhile. A possible subject for a future post?!! It is we who are devastated that you will not be able to accompany your husband on his trip to Budapest because of the clash with your part [how exciting] in a play. Should there, for any reason, be a change of plan, then please let us know as we should love to see you here to be able to entertain you and to give you a little insight into this most unusual and interesting of cities. This, of course, is the problem. Like you, we fall in love with all of these places and then want them! If money were no object, which sadly it is, then we should own palaces and castles the length and breadth of Europe. Thank you so much for the kind comment left on our previous post and to which we have made a general reply. Thank you so much, Yvette, for such a warm welcome and also for the kind comment left on our previous post to which we have made a general reply. As we have said to others, our absence was on account of our last surviving parent who is, sadly, terminally ill.
We are much looking forward to seeing the house on Saturday when, hopefully, we shall have a much clearer idea of what is actually involved. And we are so pleased to be back! Thank you so much for your concern and for the comment which you left on our previous post and to which we have made a general reply. Yes, we are always captivated by old property and are so looking forward to seeing what possibly can be done with the house on Saturday when we view it. But, having restored our apartment here, which took months, we will have to be absolutely sure before we embark on an even bigger project. Thank you so much, Virginia, for the warm welcome on our return and for the kind comment left on our previous post to which we have made a general, explanatory reply. From what you write here you so very obviously have a real feeling for, and understanding of, old property and of the qualities which give houses like this one their appeal. At the end of the day, where restoration is concerned, it really does become a balancing act to ensure that the very soul and character of the building, the reasons why it is so attractive in the first place, are not destroyed. Your kind comment on our previous post is so much appreciated. Our absence, as you will see from the general reply which we have made, was to visit our last surviving parent who is, most sadly, terminally ill. The house represents such an exciting and major project and one which we are fairly certain we should enjoy carrying out. At the end of the day it will, of course, depend on affordability. Alas! It is, as you say, Adrienne, most exciting but, at the same time, a little daunting. The house stands in just over an acre of ground so, yes, another garden would have to be made but, we think, much simpler than the one which we created during our years in Herefordshire. You will understand only too well the situation where old, historic property is concerned in Eastern Europe, now abandoned by the State which, previously, had seized it. And, as you rightly say, there is no money, nor immediate use, for such old castles and palaces of which Tura is but one example. You also perceive exactly that mixture of excitement and fear which such a project as we are considering engenders. We shall have a better idea of the possibilities after Saturday. Thank you so much for your good wishes, Candice. There will, as you may easily imagine, be much to consider over the next few days and weeks. Thank you so much for such a kind thought. We are most excited at the prospect, and a little fearful. Much will now depend on what we find on Saturday at 11.00am!! Yes, indeed, there are so many properties here in Hungary that are in need of serious rescuing that one does wonder what the future will hold for them, particularly in these times of global recession. We shall now have to see what we find on Saturday and then to know where we go from there. Doubtless we shall report back!! It is really all most exciting, not least to keep discovering all of these wonderful, neglected properties which are everywhere throughout Hungary. You would have such fun restoring and furnishing one. What about a new life in Europe?!! From your comment, you sound to be as excited as we are at the prospect of breathing new life into this,on the face of it, absolutely charming house. But, close inspection has yet to be undertaken and we are, as you may imagine, somewhat wary of what may be revealed. Saturday should tell. And, thank you so much Jessica, for your kind words on our previous post. Knowing that people care matters such a lot. Do we take this as a vote in favour?!!!! Yes, the Kastély has stolen our hearts too. But, we really must be disciplined when we visit on Saturday. And, Cathy, thank you so much for your kind comment on our previous post to which we have made a general reply. Thank you for your generous comment. We do so hope that we might be able to be the rescuers of this particular victim of the times. However, there is much to be considered and we have to face the fact that the task may well be beyond us. And yes, why are there so few examples these days of similar bravura in the construction of new buildings. With just a smattering of notable exceptions, mediocrity is the general rule of the day. Welcome back to blogging Jane and Lance. 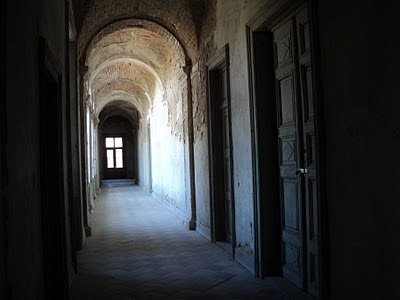 The corridors and stairs seem to be in a bad state, it looks like the place is haunted... I would not want to be in that corridor alone even during the day!!! Yes, we can see what you mean but it really did not feel quite like that when we were poking around. How it would be at night, however, well, that could be a very different story. We are so pleased that you like the look of the manor house. We think that it looks wonderful too, but as for what will be needed to restore it, well, yet again, THAT could be another different story! Jane and Lance: I'm so sorry to hear of the illness in your family. Your last remaining parent. A sad time. I'll be thinking of you. I went through this in 2008, when my mother passed away at the age of 89. She had a good long life, but I still wish it could have been longer. No matter how old we get, how old our parents get, it always comes as a surprise when they're not around anymore. I told my brother: "Now we're orphans." He said, "We can't be orphans at our age." Thank you so very much for this most kind and sensitive comment. We agree, there is something of the 'orphan' about it all when one no longer has a parent alive. For the present, he is comfortable, largely free of pain, and being looked after wonderfully well. But, each day is new in so many ways and planning too far ahead is impossible. Your kindness means so much and to know that you have felt similar emotions is strangely helpful and comforting. Thank you. Dearest Linda, we have missed you too. Many, many thanks for your kind words on our previous post to which we have made a general reply. It is so good to have the support of others at difficult times. How generous of you to think that w might be worthy restorers of the manor house, but as for being ready for it, well, let us just say that we have some doubts about that! You are so right about the prospect of a life-changing weekend. It rather feels like that. Well, we shall see and let you now!! Welcome back Jane and Lance! I have missed you and eagerly awaited your next post. And to return with such exciting news, the house looks totally bewitching. The staircase at Tura is beautiful too. Just imagine the footsteps that have graced it over the years. Good luck for your viewing on Saturday. Country life here you come! Thank you so much, dear Jeanne, for your warm welcome back. We have missed you too. And, thank you too for your kind words on our previous post to which we have made a general reply. Well, to grace the pages of Country Life would indeed be something. However, there is a long way to go yet before we should dare to proceed. First, see if the roof is firmly attached...!!! Tura is enchanting and, surprisingly, featured in Country Life in 2003. One of the reasons we were attracted to Hungary in the first place! And, it has taken us until now to get inside. Vicious looking guard dogs prevented any earlier exploration of the interior!! Hello! Thank You very much for sharing these beautiful photos! We are so pleased that you like them! We so enjoyed our visit to your blog and are pleased to welcome you here. We hope that we shall see you again. We are delighted to read that you have been to Budapest and had a lovely time. The summers do get very hot and winters bitterly cold, but we should not wish to live anywhere else. As for the manor house being our new home, well we shall have to see!! I'm finally reaching the stage in life where I'm more inclined to be sensible, but it is beautiful and very tempting. I look forward to reading about your viewing of the house. Know that I go with you in spirit on Saturday! Imagine me advising you, one way or the other-- lend an ear to the wind and I shall send my opinion with a kiss blown on the jetstream! I wait on tenterhooks to 'hear' how you have decided and what the old house itself shall speak when the two of you are in its presence. I have always dreamed about discovering and then wandering through such abandoned treasures, wondering of the possibilities that they hold. Oh Jane, MY GOODNESS is this NOT a fabulous castle? That corridor leading to one of the bedrooms...I could just sit there with a good book and dream, dream and write. THANK YOU for your wonderful comment and visit. The word EDUCARE is such a beautiful expression of what we really do...and to think that all of us are put on this earth to be educated and CARED FOR!!!!! May I please have the green furry house???? It would be a great little place in the country. Although there are a zillion reasons these troubled economic times are horrid... what will be neglected because of lack of funds is soon to become heartbreaking. How can you advocate for a building when kids are starving... it's a tough pill to swallow. It's heartbreaking to see those beautiful buildings fall into disrepair. Hopefully some benefactor will be able to take care of them. I truly love and enjoy the beauty of grand homes. We shall be guided by your very wise words. A salutary and kind reminder that fools rush in...[and all of that]. But, as you say, most tempting! We shall see. We are so very touched, dear Suze, not only by the real warmth of what you write here but also by the pure poetry and joy of your words. Be assured you will be much in our thoughts tomorrow, lending we know wise counsel. As you say here, such buildings allow the mind to run riot, to play fast and loose, and to reach new heights of imaginative speculation. We love it too! You are so right, Anita, the castle of Tura is the stuff of which dreams are made. It was pure heaven for us to wander through those empty passages and rooms, always imagining what might have been and what could yet be. Thank you for such kind wishes which we so appreciate. We love your description of the house as 'green and furry' which sounds so comforting and appealing. Let us hope that it appears so tomorrow. You raise a most pertinent point, about funds required to rescue old buildings, which is particularly true in Hungary where the number of homeless and hungry people rises daily. To our horror, two homeless people died of cold in our nearby square this last weekend. It is, of course, a great problem as to how such huge buildings, costing vast sums to restore, are to be put to new uses, particularly in a country which is struggling economically and which, generally, views them as an anachronism. Dear Jane and Lance, it is so wonderful that you are back in blogland...we have missed you. I am so sorry to hear that your absence was due to an ill relative, and a parent? I am sending prayers your way, and I will be thinking of you both. Most definitely a vote in favour! Your kind, thoughtful and generous comment here, Irina, has touched us deeply. Yes, our absence was on account of the need to visit our last surviving parent who is, very sadly, terminally ill. But, he is comfortable and being well looked after and so we take each day as it comes. And tomorrow we get to see the house! Who knows what that will bring!! Thank you so much. We need all the encouragement we can get! Welcome back, Jane and Lance! Can you guess how happy I was to find a comment from you? The mansion house is like a fortified castle with turrets, towers and trap-doors. While I love traditional Japanese architectures, I also love European architectures of various artistic style. I hope such wonderful old buildings be renovated and preserved as many as possible. The Ivy-covered mansion is perfectly lovely! Look forward to your report about it. Stay healthy and have happy days ahead. Thank you so much, dear Yoko, for your most kind and generous comment. We know from reading your own delightful blog that you are very sensitive to the need for preservation of all things which are so closely linked with a Nation's heritage. There are simply not the funds available to save all of these architectural gems, but it would at least be a positive step forward if some kind of fund could be established for the purpose. Dear Hattats, so glad to have you back! I can tell that there are dreams beneath all that ivy, and I hope there are walls as well. Eagerly awaiting updates! Your comment has really made us laugh. We must admit that we have a rather sneaky feeling that there are miles of Ivy and precious little else about the whole place. Still, as we keep on saying, we shall see!! Thank you so much for your kind words on our previous post to which we have made general reply. The support means a lot. What beautiful building. It'd be a crime if they were lost. I hope you will post the pictures when you get inside. :) It is very exciting. Thank you so much for the welcome and the kind words on our previous post to which we have made a general reply. 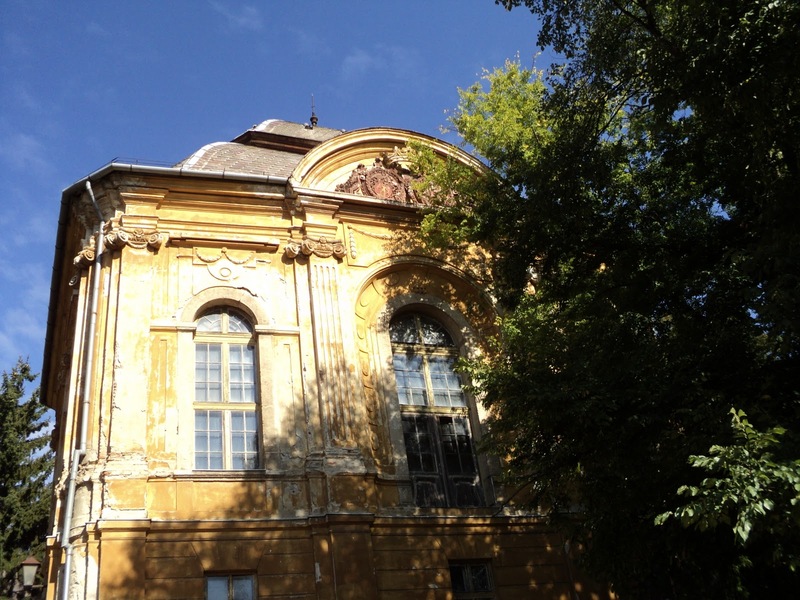 Yes, the picture of buildings at risk throughout Hungary is a very sad one indeed and although much has been done there are still so many, many more deserving of restoration. Shall we be able to save one of our own? Time will tell. We shall certainly post some images of the interior when we see it!